Sometimes just the smell of coconut can make me think I am on a tropical vacation. On a beach, glowing sun, slight breeze, sound of the waves crashing and a butler bringing me a pina colada! But alas, it is cold here in the midwest and I am dreaming of the night time I might be in a tropical locale. So instead of laying on a beach somewhere warm, I made this bowl of chocolate coconut bread pudding to soothe and warm my soul. The recipe came from Hungry Girl. And it turned out oh so delightful. I actually added white chocolate chips on top instead of milk chocolate chips. Try it, you might like it! Pouring on the marshmallows and white chocolate chips! 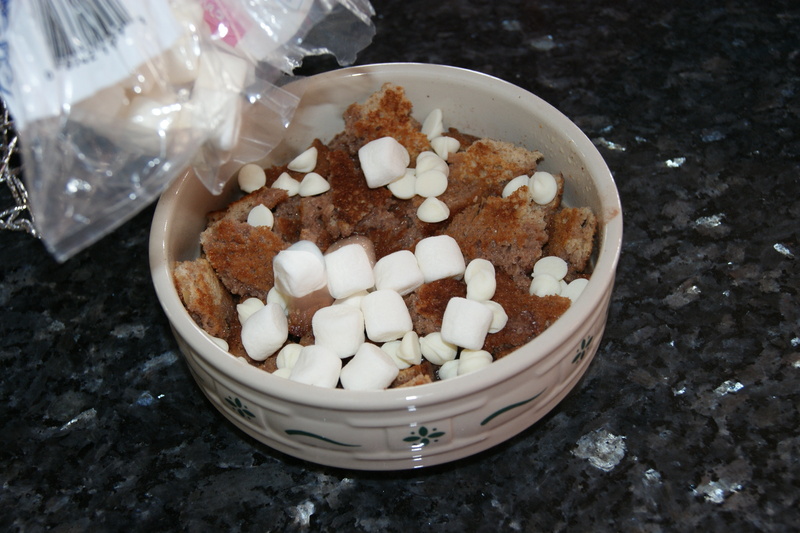 This entry was posted in Deliciousness and tagged bread pudding, chocolate, coconut, marshmallow. Bookmark the permalink.